Molly Shannon appears as a woman who has recruited a number of children to act as her sons, killing their biological families. Meanwhile, Hannibal treats Abigail with psychotropic mushrooms. The A.V. Club: This is the episode with Will’s monologue about seeing his house as a ship upon the sea. There’s so much poetic language and dialogue here, and that’s unusual for television. How do you approach writing that while still making it sound like something people would say in conversation? Bryan Fuller: A lot of that is Thomas Harris. Whenever I got lost in a scene or was like, “What are we telling here?” I would go back and start reading passages of Red Dragon that I had earmarked, and frequently I would find a turn of phrase—that was sort of a radar ping to synchronize me with Will Graham and who Thomas Harris intended Will Graham to be. So there’s a lot of Thomas Harris quotes throughout the series, and looking back at his house and seeing it as a boat on the sea was something from the foreword of Red Dragon, that I thought, “Oh, how beautiful and poetic. I want to see those words coming out of Will Graham’s mouth.” A lot of it is really honoring Thomas Harris and the way he wrote Red Dragon, because more so than Silence Of The Lambs or Hannibal, Red Dragon is filled with beautiful, poetic prose. I’m re-reading Hannibal now, and there’s a directness of his prose in Silence Of The Lambs and in Hannibal that is not as purple as the way he wrote Red Dragon. Red Dragon’s my favorite of the books, because it is written with such a poet’s ear. Whenever it gets really flowery and poetic and it’s dialogue, chances are that’s a Thomas Harris quote of some kind that’s kind of been repurposed or reinterpreted or re-imagined somehow. That’s where a lot of that poetry comes from. AVC: This episode is very much a procedural episode. There’s a case that’s solved, and there’s little of the serialized story that intrudes. You do a number of these throughout the season. How do you do a story like that and still keep it Hannibal? BF: The idea is mostly reducing the amount of beats we take to tell the story of the crime procedural and focusing on what the characters are going through. So you’ll see an episode that has maybe four or five scenes that actually have to do with the criminal investigation, and the rest are character. I think sometimes we were successful at that, and other times we weren’t. It was just about the alchemy of that balance: the case to keep the story going forward and helping people understand what the episode is about at its core. That particular episode was about family, the formation of family, and Will Graham opening himself up to the idea that this forensic team—Abigail Hobbs, Hannibal Lecter—they are all becoming a family unit in a way that he hadn’t been used to before. It’s also reflective of Hannibal’s step to be a more active father figure for Abigail Hobbs, and that involves mushroom therapy or psilocybin and how that would break down certain psychological barriers, so he could better help Abigail Hobbs—but he’s very much looking to replace or sublet [Laughs.] the role of Abigail’s father in a way that gets us wondering, “Who is this Hannibal Lecter?” The guy that we imagined in the cell, sucking at his teeth and talking about census takers, is not this man who’s invited a young woman to his home as a parent, not a letch, and is trying to actually provide some kind of guidance for her and be helpful. It felt like it was inclusive of who Hannibal Lecter could be. It never said that he wouldn’t do those things, but it felt like it was well within his range of the character to have that care be expressed. Particularly for a young woman—once again going back to the loss of his sister. AVC: This episode was not aired, and it wasn’t even sent out to critics initially. What was prompting your hesitation, beyond the news event that allowed the cover to remove it? BF: Initially, there was hesitation on behalf of the network, which is why they didn’t want it to go out to critics, because they were worried about that being part of the conversation with the show. “Oh, there’s children killing children with guns,” and that sort of thing. Then when we got closer to the airdate, the question came up again, like, “Are you guys going to air this?” I was, at that time, fine with not airing it and was also wondering, “Is this a good idea? Is this not a good idea?” Every day I opened The Daily Beast or Huffington Post, there were rows and rows of children’s faces with crosshairs over them, and I thought, there’s something really creepy happening in the nation right now, and perhaps we need to put a little distance between us and that, so we don’t become part of that conversation. But honestly, in retrospect, I think it probably would have been fine to air. It’s just at that time, it was such a topic of scrutiny that it was really about protecting the show and putting the very best foot forward. Looking back, it probably could have aired without any fanfare. AVC: Molly Shannon’s character is an interesting take on some of the issues the other characters are going through. Where did the inspiration for that character come from? BF: The inspiration was what would somebody with such a perverted idea of family, how far would they go? I’d worked with Molly on Pushing Daisies, and she had just visited Toronto. I was having dinner with her, and we were talking about how much we wanted to work together again. I was just sitting across the table from her and thinking, “Oh, she could be this woman.” This wounded woman who’s trying to craft a family for herself that functions under her rules and the way she sees the world and was almost like a cult-like mother figure—motherhood gone wrong seemed like it was an interesting place to go. While Will and the team pursue a killer who is turning corpses into angels by cutting away the skin on their back and turning it into wings, Hannibal meets with Jack’s wife who reveals a secret: She has stage-four cancer. AVC: How did you find Laurence Fishburne to play Jack Crawford? BF: A producer on the show had worked with him in the past and said, “What do you think of Laurence Fishburne as Jack Crawford?” and I was like, “Oh my God, are you kid— don’t even tease me if it’s not a possibility, because I love that idea.” He is such an iconic actor, and looking back at roles as diverse as Apocalypse Now and The Color Purple to The Matrix to Cowboy Curtis [Pee-wee’s Playhouse], there’s such a fantastic range for Laurence Fishburne that I thought, once again, we can go anywhere with this character. We were all inspired by him as an actor and his iconography and thought, if we get somebody like Laurence Fishburne, we can tell a much more sophisticated, complicated version of Jack Crawford than we’d seen before as this large and in-charge and in-control guy, who is unflappable. Throw into that mix the losses that he would experience: We know from the literature that his wife dies in Silence Of The Lambs, yet in Red Dragon, he’s talking about vacations with her, so we know somewhere between Red Dragon and Silence Of The Lambs, things go south with her health. I thought it was a great opportunity for Hannibal to really get underneath Jack’s skin in a way that can bond them closer to each other, so when suspicious things start to happen, the first person that Jack looks at isn’t going to be Hannibal Lecter. Because he has such an intimate relationship with him now. The idea of casting Gina Torres as Bella Crawford—the first thought was, “I wonder if Gina would do that, or if it would be too close to home?” I had emailed Gina and said, “I loved working with you before. I would love to work with you again. There’s this role. If it’s not too weird to play your husband’s wife in fiction, then I would love for you to consider it,” and she said, “Well, tell me more about the role.” I just laid out that this is a very strong woman who is grappling with mortality and her relationship and her humanity in the face of a terminal illness, and yet I didn’t want it to feel like it was a Lifetime movie about the big C, but was a version of someone coming to terms with that diagnosis in the context of an elegant horror film that gave it a grounding humanity to the rest of the story that was being told. I thought she was wonderful in the episode, and the scenes between her and Hannibal where we laid out the twist—you think she’s having an affair, but actually who she’s seeing is her oncologist. She has stage-four cancer, and she doesn’t want to tell her husband because her husband has too much on his mind, and yet, even though she doesn’t want to share her diagnosis with him, she still is resenting him. It just felt really complicated and human. It was an inspiration to write for her again, so I was very excited about rolling up my sleeves and writing a relationship story that you wouldn’t expect to find in the Hannibal Lecter story. AVC: The “Bella has cancer” arc is another way to look at death. The show has so many different ways of looking at death, and you have looked at death so many times throughout your career. What keeps you coming back to that subject matter? BF: It’s what we’re living up against. We have this wild life experience that is full of fantastic minutiae and banal, huge events at the same time. Yet, all of it shrinks in the shadow of death. [Laughs.] It’s hard to argue with death as a game-changer. I’m fascinated with it because it’s the punctuation—the punctuation to the sentence that is life. Growing up, there were a lot of funerals that I attended, and the adults at the funerals went out of their way to make sure that I wasn’t traumatized or overly depressed by them. So death is always a celebration of life for me, and it’s also hugely dramatic. It doesn’t get more dramatic than death. As a horror movie fan, I was very obsessed with horror films. Still am. I love the genre. For me, horror films are opera, and they are… instead of consumption killing off the young lovers, it’s Jason Voorhees or Michael Myers. It is when the stakes are at their absolute largest in a story: whether somebody is going to live or die. In a way, it’s just holding up a mirror to life. We only really, deeply consider what our life is when we’re faced with mortality on some level. AVC: Were there horror films other than the Hannibal films that you drew on in conceptualizing this series? BF: Oh, absolutely. Every random horror film from the ’70s and ’80s. For instance in “Amuse-Bouche,” the mushroom-man episode, I can’t not think of Motel Hell, with Rory Calhoun as Farmer Vincent, who is picking up hippies and butchering them and turning them into sausages. There’s a lot of inside references to different horror movies in each of the episodes, whether it be an iconic image or a notion. The antler thing from the pilot, I was obsessed with Salem’s Lot growing up and saw it very early on, when James Mason picks up that schoolteacher and dropped him on a wall of antlers. I just thought, [Quiet, anxious voice.] “Oh my Godddd! How horrific!” That was an image that stayed with me; so many of those images are being processed and filtered out in different ways on the show. AVC: This episode has sort of a Gothic, almost religious, sensibility to it without crossing over into the religious. What about that set-up appealed to you, and why did you choose to use it? BF: Well, it seemed like the idea, once we started with the blood eagle and these victims looking like angels, it felt like there was a non-denominational take on an afterlife and protection from that afterlife. It felt like it was intrinsic; once we were talking about a serial killer making angels, there was a certain amount of Judeo-Christian symbolism that was going to be part and parcel with the story we were telling. Having a guy who had a near-death experience—who was compromised by his body betraying him—felt like it was something that invites religious speculation. Where you’re thinking, “Why me? Why has my body betrayed me? What is my role in the universe? What has God fated for me that this is now my role?” Those questions seemed to be appropriate to explore in this episode. AVC: You dance right to the edge of saying that he actually can see sin, which he shouldn’t have the capacity to see. Were you intimating something supernatural, or were you intimating he has some kind of psychological insight that he doesn’t even realize he possesses? BF: We were very much walking the line in between those two concepts; I love the supernatural in storytelling. The Twilight Zone was a huge influence on me, in terms of writing and storytelling, where you’re not restricted to the parameters of reality to tell your tale. Hannibal is very much a secular story, even though we dance right up to the supernatural a few times in the show, and, arguably, you could say we dipped our toe in an instance or two. That’s just me wanting that tool to tell a story and also not wanting to be restricted by reality, with how we’re telling a tale, because we are a heightened reality on Hannibal. There is a larger-than-life quality to the storytelling when it gets into particulars. I like the idea of being able to dismiss reality, depending on if we can sell it as part of the story. A nurse at a hospital for the criminally insane is murdered, and it appears to be the work of the Chesapeake Ripper, one Dr. Gideon (Eddie Izzard), who was locked up for Hannibal’s crimes. In a flashback, it is revealed how one of Jack’s trainees stumbled upon Hannibal’s secret. AVC: This is the first time we directly see Hannibal kill somebody in flashback, and it seems that you become much more explicit about his crimes as the season goes on. Why did you make that choice? BF: It was very much a conscious effort to lull the audience into a false sense of security of how we were going to be telling the Hannibal Lecter story. Then once we do see him kill, you are reminded of who the character is and what story you’re telling. And that’s the point where the scales fall away from the audience’s eyes about who he is—but not necessarily Will Graham’s eyes, until much later. It was really about—we’ve introduced you to our idiosyncratic Frasier Crane psychiatrist who’s a bit of a dandy and has a taste for the finer things of life, and, oh yeah, he will kill you and eat you if need be. [Laughs.] It was a matter of the timing feeling right—we had always talked about around episode seven or eight would be the first time we see him kill. AVC: So you have the Miriam Lass storyline that weaves its way through the rest of the season, and this is a very important part of Jack’s backstory. Was this something you had come to through the books? BF: We came up with it on our own, and the impetus was there were certain aspects of the story that were great in Red Dragon, but because we had shifted how Hannibal and Will Graham knew each other, we could no longer do. We could no longer have Will Graham pick up a drawing of a wounded man, and go “A-ha!” because it felt like that was a dynamic that was about these characters not knowing each other or having any sort of history with each other. Now that we’ve done that, we had to do something differently to see how Will Graham catches Hannibal Lecter or discovers his crimes. So it felt like as we were dealing with Jack Crawford struggling with the impending loss of his wife, to reflect on previous losses that give us a little bit of context with Jack Crawford and also [Hannibal’s] history as the Chesapeake Ripper. It was our Silence Of The Lambs episode, because we were taking Clarice Starling and Hannibal Lecter from Silence Of The Lambs and turning them on their ear, doing them without doing them. Casting Eddie Izzard as a pretender to the throne of Hannibal Lecter in this context felt like it was both meta-storytelling and also appropriate to our timeline and the story that we were telling over the course of the season. And an interesting character to add into the mix. AVC: Hannibal himself cast a wide shadow over pop culture, but Silence Of The Lambs is a cultural touchstone. You almost flirt with iconography from that, with story points throughout the season. How do you approach that and pay homage to that without getting overwhelmed by our memories of that film? BF: ﻿It’s really about dancing on them very delicately. It’s also us, the writers, as storytellers, acknowledging the inspirations for the story that we are currently telling. ﻿Silence Of The Lambs﻿ is a ﻿fantastic﻿ film. It’s a horror film, and it’s an incredibly well-told film that is about point of view in such a unique way. The way that film is shot, the way the eyelines are so close, if not directly into camera, betrays an intimacy with the characters and the audience. And I thought Jonathan Demme directed it brilliantly. The cast was unparalleled, so we can’t pretend it didn’t exist. But, we can acknowledge it in a respectful way that says, “Yes, this is part of our history that we are going to borrow from, to acknowledge,” in a sentimental way. Those moments for me are always very sentimental, because I’m re-imagining an incident or a story-point in the context of this new version of Hannibal, but it also allows me to show the audience what was so inspiring to myself and the other writers with this story. It is an homage in a very genuine, honorable way of the word. AVC: In a film, the audience doesn’t have to live with Hannibal as long, so it doesn’t have to see the consequences of what he does for as long as it does with TV. That makes your Hannibal more monstrous and demonic at times. How did you play around with gradually revealing the evil of what he was doing to everyone around him? BF:﻿ One of the very first meetings with Mads Mikkelsen about this role, he referenced that he didn’t want to play the role the way Anthony Hopkins did or the way Brian Cox did. He wanted to play him as though he were Lucifer himself. And that stuck in my head in a very cool way for me, because I ﻿love mythology and I ﻿love… you know, I was raised Catholic, so anything Judeo-Christian in terms of mythology is always very exciting and fascinating to me because it’s so rich. The idea of suggesting that Hannibal Lecter—in the book, he has a sixth finger and red eyes, and so there is a devilry in Thomas Harris’ presentation—so it felt like it was completely honest and appropriate for the character. And we often talk in the writers’ room, “Okay, there is the Hannibal as the devil explanation of that plot point, but we also need to ground that in a reality that is answerable to the physics of the storytelling.” How did that ear end up in Will Graham’s stomach? On one hand, Hannibal Lecter is the devil, and he put it there by devilry. On the other hand, Hannibal Lecter is a man who got a fondue fork and [Laughs.] shoved it down Will’s throat when he was having an episode. We like to have both explanations available for us to understand the character, and the one that I always gravitate toward in my mind is the one of him being the literal devil, but I always have to have a physical answer to back that up, so it’s not all of a sudden a fantasy piece. AVC: You’re also foreshadowing what happens to Will with what happens to Dr. Gideon, played by Eddie Izzard. How did you arrive at casting Izzard in that part, and how did you come up with that character? 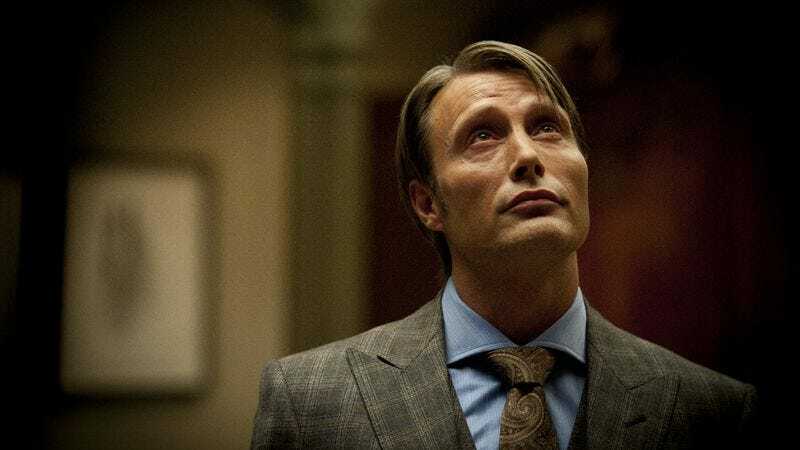 BF:﻿ We knew that we were going to be doing a Hannibal Lecter-like character to juxtapose who our Hannibal Lecter was in contrast to how we’ve seen him portrayed previously. That was also another reason for some of the iconography from ﻿Silence Of The Lambs﻿ being put to use. The simpler answer is that I think Eddie Izzard is one of the brightest minds of our generation. I don’t see him as a comedian as much as I see him as a philosopher. I hope I get to work with him on everything until I die, because I think he has a great mind and is a very talented actor. So I love working with Eddie. AVC: You worked on two adaptations this past TV season. What would your advice be on adapting a work, especially for television, which seems to be more common now? BF: ﻿For me, what is interesting in any sort of project where you’re going back to a well of any kind—on ﻿Mockingbird Lane﻿, I wanted to see The Munsters. I loved the original ﻿Munsters,﻿ and it was also an incredibly influential show on me as a storyteller—but I always wondered what it would be like if they actually ate people and were doing the things that monsters do, and that wasn’t sugarcoated. So that was my impetus. That was my desire to do The ﻿Munsters﻿: that there was an element to it that I hadn’t seen before. What would it be like if that new aspect was folded into the omelet? The same goes for Hannibal. I hadn’t seen him in society, so that was the element, the key to changing or validating another version of the story. There has to be some big component or shift to the story that differentiates itself and validates its existence. If you’re doing exactly the same thing, there’s not really any merit in doing it, beyond masturbation. So it felt like with both Hannibal and Mockingbird Lane, it wasn’t just masturbating. [Laughs.] As I often am. When victims begin appearing around the area with their organs removed, Will has to determine if the Chesapeake Ripper has returned for the first time in years. AVC: This is another one that was moved out of order. Do you remember why that decision was made? BF:﻿ In the grand turning of the ship that we discovered in the process of making the show, there were two episodes that had to have new material shot for them and had to be restructured: One was “Sorbet,” and the other one was “Œuf.” Those two, when we got those shot, it was like, “These two episodes do not work for various reasons and will require additional shoots.” So we were able to figure out what to do with “Œuf” relatively quickly, and then my mind, when I saw “Sorbet,” I was like, “Okay, this is happening too quickly.” To see Hannibal doing all the cooking and the killing, that’s happening too quickly, and we need to push that off. When we pushed it off, we pulled out certain elements of the story that felt like it was rushing the characters along too quickly in their process. So it was like, “This episode needs to come after things have developed a little bit, and then it will make much more sense to see Hannibal preparing a dinner party once we’ve established who he is and what he’s capable of. So let’s put it after he has taken a life on camera. Then we filmed some additional scenes that made it about Jack Crawford and his relationship with the Chesapeake Ripper and made that clearer. We had two days of additional shoots that were designed to really focus the story, end the arc where it belonged, bring out more of Jack Crawford, make it part of his Miriam Lass/Chesapeake Ripper arc and set that up in a way that we can spike that ball in season two. That ball being the Chesapeake Ripper storyline. So it was really a matter of thinking quick on our feet and saying, “That doesn’t fit there, coming as episode four, but it would be much more effective to have Jack be on his journey of “I am putting people on the front lines to save lives, and that is also doing a lot of damage to those people.” Really tying in his worries about Will Graham with the loss of Miriam Lass and also Hannibal lulling him into a false sense of security about their relationship. It felt like there were certain story-points that we abandoned because they just felt too rushed, and then the stroke of, “Oh, that’s what we need to do with this episode,” was pulling Jack Crawford’s arc more cleanly into the story. Which wouldn’t have been as effective if it had come early on. AVC: It seems like, in addition to death, you like to present scenes of people eating really good-looking food. What is it about food or the act of eating that you find interesting to depict on television? AVC: Are we supposed to assume that most of the time he’s feeding his guests human beings? AVC: Are you already playing around with how you’re going to do that reveal when the time comes? BF:﻿ There’s a couple of ways that we’re talking about, how people find out what they’re eating. I think they’ll be very upsetting. [Laughs.] For those characters. AVC: At this point in the season, you start building these moments when the audience has seen Lecter kill, so now there’s a real desire for Will to cotton on, yet Will is steadily falling down into his encephalitis. How did you play those twin impulses against each other? Because he sees Lecter performing surgery here, and there’s a moment when we want him to make that leap. BF: ﻿Yes, and he does sort of look at him, and he wonders, like, “Oh, thank God for that,” and he doesn’t quite make the connection, but a seed is planted. It was really about putting so much emotional debris in front of the eyes of the characters. With Will Graham, it’s encephalitis and constantly trying to get him distracted with where he is in his therapy, and the same goes for Jack Crawford, using Bella and Miriam Lass as a distraction for him not to be able to see clearly what is right under his nose, was very much a strategic manipulation for Hannibal to stay where he is. AVC: The story of waking up with one of your kidneys removed is an urban legend that has crossed into many different horror films and non-horror films. An episode of Justified used that storyline, for example. What do you think it is about that particular story that pings something in writers’ radar? BF: I think because it is a very well-saturated story and we’ve all heard it in some frame of a story, we’ve heard the urban legend of waking up in a bathtub with a kidney missing. It felt like if we are telling an organ-harvesting story, it was really about quickly selling the iconography of an organ-harvesting story, and then being able to mask that as a perfect way for Hannibal Lecter to go shopping for his menu. AVC: You talked about how Hannibal, can be either the literal devil or someone who does things realistically, and yet, he seems to get away with pretty much everything he wants to. How do you justify that, and is that something you’ll be returning to later? ﻿ÓBF: [Laughs.] Our idea for Hannibal is that he’s very reactionary—he’s somebody who can adapt really well to circumstances. For instance, when he is murdering Sutcliffe, he’s actually trying to set Will Graham up, and then Georgia Madchen walks in on him, and he adapts to that plan. When Will Graham starts to figure out that there is someone who’s very close to these characters that knows more than anybody else, then he adapts to that. If Hannibal has too big of a master plan, then it starts to feel artificial, but those events are often Hannibal adapting to circumstances as they shift and change and being very fluid with how he is controlling the story. Come back tomorrow for an examination of episodes eight through 10 as well as Fuller’s thoughts on Alana Bloom.